How do you Brand your Project? While I was looking for something to write about this week, I came across this blog on Branding your Project by Method123 Project Management Methodology. It got me wondering about my own projects and how actively, or subconsciously I do project branding. conscious communication, almost to the point of over-communication– There is a balance between airing dirty laundry and being honest about issues as they arise. consistent and thorough documentation– the more you can document the project process and make available to stakeholders, users and those expected to support it builds credibility and goodwill. building the bridge between business and technology-Removing perceived obstacles and making sure technical solutions meet the business needs results in better solutions, and happier stakeholders. actively acknowledging hard work– project members, both from the implementation teams and the business teams, need to be recognized for a job well done. This could be as simple as thanking them for their flexibility as you manage meeting times across global resources. Or it could be for figuring out a really complicated problem. I think establishing your project brand is a lot like the things you do to establish your personal brand. It reminds me of the phrase “do your job, do it well and you’ll be asked to do it again.” By doing the things you need to do as a project manager to effectively manage your project, you lay the groundwork for the project brand. Each artifact, milestone and decision point are opportunities to present the project in the best possible light. If you can’t, or choose not to, capitalize on those opportunities, you leave project perception up to fate. I would rather be deliberate in my message and my management, controlling the project image. You can do this successfully even when you need to deliver bad news. So, what do you think? Do you actively or passively manage your project brand? There are an abundance of articles on procrastination – ways to avoid it, reasons why it exists, etc. I wasn’t able to find many resources on how procrastination negatively impacts other people. 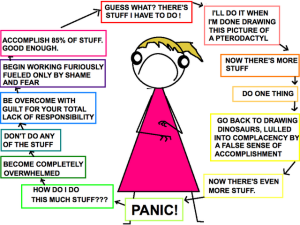 When it comes to procrastination, It’s really not all about you! Your procrastination is impacting everyone you work and/or interact with. As a project manager, this comes up quite a bit. The project manager diligently breaks down the work, assigns the baseline schedule and owns overall responsibility of making sure the work gets done. We rely on the project team to fulfill their responsibilities and ensure the work gets completed. If a single project team member procrastinates on any single task, it will have a trickle down effect on all other tasks that need to be completed. Procrastination by definition is the avoidance of doing tasks that need to be done. This does not include the scenarios where work goes more slowly as a result of a problem or new information. This is truly the work that a resource puts off because he/she just doesn’t want to do it. While project managers know that this is a common enough occurrence, I think it’s human nature to assume your procrastination isn’t hurting anyone other than yourself. But in reality, it will impact anyone directly linked to you. A couple of days ago I got into an argument with my daughter for this exact topic. Her high school requires that each student fulfill 15 hours of community service during the course of the school year. While 15 hours over 10 months doesn’t seem that cumbersome, my daughter plays ice hockey September-March. She is on the ice 6 days a week and has to fit homework and other responsibilities on top of that. Now that we are winding down hockey season, I asked her to conduct some research and identify opportunities she could do over spring break. She promptly told me she “had it covered’ and would fulfill the hours, but when I pushed her for more details, she had nothing to offer. She assumed that I was pushing her because I didn’t trust her. That really had nothing to do with it. In prior years, we had to scramble to get everything done in time, rushing around in the last minute. Given my other projects and responsibilities, I need her to plan more effectively. I got quite frustrated with her as there is no real effort to do the research (the school provides a list of pre-approved organizations and activities). In this case, her procrastination doesn’t just have the potential for disrupting her grade, it will most likely disrupt my schedule as we have to cram 15 hours over the next month (and she doesn’t drive yet). As you push off until later the thing you need to do today, please consider the impact you will have on those around to you. At some point during the course of a project, a transition must occur. Ideally this doesn’t occur until the end of the project when you are transitioning from the implementation phase to the support phase. Unfortunately there are times when transitions need to occur during the implementation phase. Regardless of the scenario, I have found that there are a few things the Project Manager/Organization can do to make this transition go more smoothly. Establish a process for project artifacts (specific documents and central storage) – While each project may have slight variances to a set process, the more aligned the project documentation is, the easier it will be for a new team member to come up to speed. At a minimum I think this should include standard templates for project status including decisions, action items, upcoming goals and most immediately resolved items; project plans; statement of work & change orders; and support documentation that provides the technical details as well as business rules that impact the implementation (what will the support team need to know to manage the day to day operations of the implementation?). The central repository for project documentation makes it easy for anyone to step in. They know exactly what has been transmitted and can see the progression of the project over time. Without these, time is wasted on finding the components rather than really digging in figuring out the state. Establish a process for team hand off – Once the new team has had a chance to review the project artifacts, it is important to bring all technical resources together. When you work on a long term project and try to document all the nuts and bolts of what you did to implement, sometimes there are intuitive pieces you fail to document. These are components that are so obvious to you that they have become insignificant. However, new resources won’t know and won’t necessarily know to ask, unless they have faced that situation before. In the process of talking through the implementation to educate the new team, these details surface and can be captured. Communicate! – The need to communicate only becomes larger during times of transition. The project manager needs to be fully engaged with all team members and stakeholders. Being open and honest about the transition state yields a bit of flexibility among the project team and stakeholders. Make sure to leverage this time to ask the basic questions you don’t know the answer to you and level set expectations. Project transitions are inevitable, but don’t have to be a horrible experience. Having the proper project documentation, a central project document repository, team hand-offs and very open communication will significantly reduce the risk and improve the success. This morning as I was trying to identify a topic for this week’s blog post, I came across this post from The.Project.Management.Hub on what superpower you wish you had as a project manager. This reminded me of the icebreaker activity at last night’s STEM for Her Volunteer Appreciation event. I recently read Strategic Connections and was very interested in the mechanics of how people introduce themselves during networking. While I hadn’t really thought about it beforehand, I was definitely able to relate to the problem of having a conversation shut down once names, titles & companies were exchanged. While I was planning the volunteer appreciation event, I really wanted to make everyone feel welcome and make networking easy. Instead of the attendees getting bogged down in the details of companies and titles, I created an ice breaker focused on each person’s super power. Since these were all women affiliated with advancing the #stemforher mission, I thought there might be some pretty interesting responses. I was not disappointed. Today, I’m going to share some of these super powers with the hope of inspiring you to think about yours. This super power allows you to quickly assess the needs of people and bridge the gap to other people who can help. The connectors among us establish lasting relationships and generously share of their network. This super power allows you to overcome large obstacles and deliver amazing results. This power allows you see beyond the problem obstructing your path and allows you to create the plan to circumvent it. The ability to see the future puts you ahead of the game. You can anticipate the direction and adjust your plan to fulfill your goals. This super power allows you to be malleable to any situation. This power makes it easy to adapt to the temperament, setting and character of any situation. It allows you to rise above the fray to be successful and deliver your desired outcome. This super power combines the ability to see the future with anticipating issues before they arise. Time travelers can adjust quickly to prevent small issues from escalating. I hope you were inspired to think about your super power – that unique thing that you do really well and allows you to excel at whatever you do. I also hope you’ll consider sharing it with me the next time we meet. Instead of saying “Hi, I’m Dagny Evans, Managing Director at Digital Ambit”, let’s initiate our conversation with “Hi, I’m Dagny Evans, I use my time travel super power to successfully deliver complex data projects.” It sounds a lot more interesting!